Prairie Valley’s Kincaid Johnson goes up for a spike as a blocker from Windthorst looks to block her. Johnson tied for the team lead in kills with five and digs with six. The Nocona Lady Indians were able to win at home Tuesday night against Denison. After easily winning the first set 25-14, the Lady Yellow Jackets were able close out a tough second set 25-23 to tie up the match. After that, the Lady Indians were able to bounce back and win the next two sets by comfortable margins 25-16 and 25-20 to win the match 3-1. Averee Kleinhans led the team with 21 kills and was tied with Rachel Patrick for the team lead with 11 digs. Trystin Fenoglio led the team with 25 assists and Ella Nunneley led the team with 4 aces. Coach Tiffany Clay liked her team got the win, but knows there were things they could have done and need to get better heading forward. 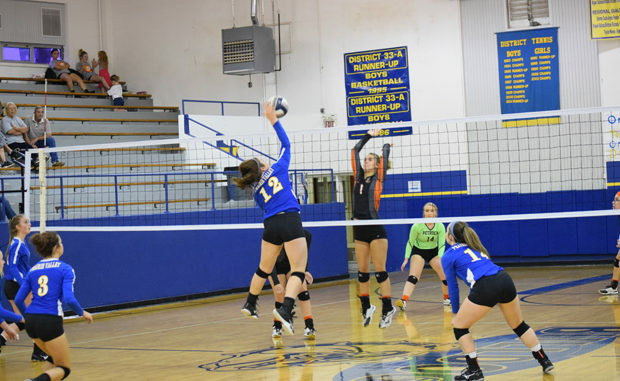 Nocona’s next game is its final non-district match. They play Melissa at 5 p.m. on Sept. 18 at Melissa. The Prairie Valley Lady Bulldogs lost a tough one at home Tuesday night in their opening district game against Petrolia. The Lady Bulldogs almost pulled out the win in the opening set, but the Lady Pirates were able to close it out to win 25-23. The next two sets saw Prairie Valley struggle to keep pace with Petrolia as they ended up losing 25-15 and 25-17 to lose the match in straight sets 3-0.